A wonderful day with Jay leading the group. Twelve of us set off for Culbone church from the lane at the top near the Culbone Inn. Just as we began our descent at the top of the path, we stopped to tune in and ask permission of the gatekeeper spirit of the place. We stopped at another gateway again and this time Jay read us one of his poems. He is convinced that Coleridge wrote his Kublai Khan poem with Culbone Valley in mind – “that romantic chasm” … He apparently wrote it at Ash Farm which overlooks the valley and that explains why the man from Porlock interrupted him. After the second gate we walked in meditative silence for two hours which included arriving down through the woods to the church itself. This is a very pretty wooded valley with a stream where the church sits. We agreed not to speak again until we met up at one o’clock for picnic lunch by the big stone market cross in the churchyard. Curiously our silence had a silencing effect on all other visitors who arrived. After lunch we had a sharing circle on the grass beside the church next to the stream. Everyone agreed that it was a very special place. It has had a strange history as a leper colony and a place for outcasts. Jay paid tribute in particular to Joan Cooper who had lived there for many years as a clairvoyant and seer. She claimed that the place had always been dedicated to teaching and has written her own wisdoms down which one of the group suggested is stored at Exeter University who have catalogued her work. Then we had an hour or so to continue the delightful walk winding downhill to Porlock Weir and the sea. Some of us walked back up, others took a taxi as we were let down by a change in the bus service, so double check that if you plan on visiting. Culbone is a very special place and it is also one of those ‘anonymous places of the spirit’. You can find it easily enough if you want to off the coastal A39 high on Exmoor’s edge beyond Porlock Hill, turning right at The Culbone Inn, and following signs for Ash Farm (where Coleridge wrote ‘Kubla Khan’ in an opium- induced reverie in 1798: the ‘deep romantic chasm’ points to Culbone Valley just below); and then Silcombe Farm, where you arrive in a small grass lay-by 50 yards up from a five-bar wooden gate which has the church service sheet pinned to it. Mostly ramblers find it. From there on, you become one of them, walking a level then descending stony path; the sea still visible ahead of you reaching the South Wales coast before you come to the edge of the wood. From there you can either turn right in among the trees or go straight on: either way, the walk and the silence is preparation for what lies beneath in the valley’s depth, high as it still is, hundreds of feet above the sea. 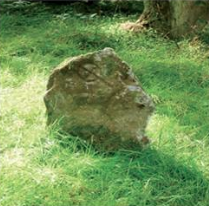 Culbone with its tiny 9th Century church dedicated to the Welsh St. Beuno is truly a place of peace, as Joan D’Arcy Cooper, an American who lived at Culbone Lodge for thirty years until her death in 1982, recognized and named in her writing. Joan, a Christian mystic and clairvoyant, was both a remarkable teacher and spiritual healer; she also recognized (as Barry O’Connor, its present owner, emphatically does) that the place itself is a healer, both overtly and discreetly. It is also a place to be simple as well as grounded, to let go of the things you don’t need. It is a place to receive. Culbone is both light and dark; it remembers its past. In all its long history it has also been a place of suffering as well as poverty. And after dark on a very cloudy night it can be so black you can barely see your hand in front of your face. It is one of the so-called ‘dark spots’; correspondingly the stars you can see when the sky is clear are scintillating in their multitude, a great spray curving above the treetops into infinity. I first came to Culbone in 1992; it has stayed with me ever since, as it has with many as the visitor’s book in the church continually testifies. Thousands have been here and have been touched by its spirit, with or without words. It is a fragment of unspoilt earth (too precipitous in itself to have ever been cultivated), and a self- preserving portal, or entry-point of heightened energy, which is said to be particularly strong on the ‘Lovelace Seat’ at the top corner of the churchyard. And the picturesque church is only a part of it. What surrounds it invisibly, which Joan believed was imprinted from the beginning, may also remind us that ‘everywhere is sacred’. The rest is for each of us to discover, and in our own being. A centre under the world that holds.